PBD Worldwide is proud to announce their recognition as one of Atlanta's and Chicago's Best and Brightest Companies to Work For® for 2016. 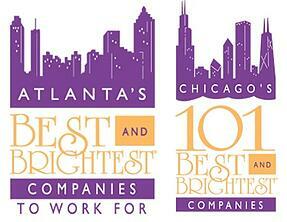 Every year companies throughout Atlanta and Chicago compete to be named one of their cities “Best and Brightest Companies to Work For®.” Only companies that distinguish themselves as having the most innovative and thoughtful human resources approach can be bestowed this honor. This is PBD's fifth consecutive year appearing on the Atlanta list and second consecutive year on the Chicago list. The winning companies from each city also compete for 13 elite awards, one granted for each category. Also, an overall winner that has excelled in all categories will be honored with a “Best of the Best Overall” award. The elite award winners will be revealed during the annual human resources symposium and awards program held in each city. This year the Best and Brightest Companies to Work For® awards program has raised the bar with a new category. Winners will be pooled by the size of their company. Employers with 0-100 employees will be benchmarked together and will be classified as Small Business; 101- 300 employees will be benchmarked together and will be classified as Medium Business; 301+ employees will be benchmarked together and will be classified as Large Business. All companies, no matter their size, can be a Best and Brightest Company to Work For® resulting in Better Business, Richer Lives and Stronger Communities. The Atlanta winners will be honored by the NABR on June 21 at the Atlanta Marriott Perimeter Center. The Chicago winners will be recognized by the NABR on Friday, July 15, 2016 at the Chicago Marriott Southwest at Burr Ridge. For more information, please visit: www.101bestandbrightest.com/.